"In addition, we are currently experiencing slowing prescription growth in the overall market as well as a soft seasonal business. These factors combined are leading us to reduce the mid-point of our guidance for this year by five cents per share. ExtraCare is the CVS savings and loyalty rewards program that’s free to join. As a member, you can earn 2 percent back on most non-prescription purchases in the form of ExtraBucks, which are issued quarterly. You can also get ExtraBucks for certain items in the CVS weekly circular. Rewards are printed on your receipt at the time of purchase. You can sign up online for ExtraCare or pick up an application in stores. Moreover, you can use the rewards for in-store and online purchases. Be sure to register your card at CVS.com to get email offers and send CVS coupons and ExtraBucks rewards to your ExtraCare card. Finally, you should pay attention to the expiration dates on your rewards so you don’t lose them. To receive rewards for prescriptions, ExtraCare members must sign up for the ExtraCare Pharmacy & Health Rewards program, said money-saving expert Andrea Woroch. You’ll earn $5 in ExtraBucks rewards for every 10 prescriptions you fill. Additionally, you will be able to get rewards by filling prescriptions at Target, since CVS bought the big-box retailer’s pharmacy businesses at the end of 2015. You can use rewards on most products in the stores and online — not just pharmacy items. Be aware that pharmacy credits expire at the end of each year, Woroch said. According to Woroch, CVS customers can earn $5 in ExtraBucks for every $50 spent on beauty products and an additional $3 on their birthdays through the ExtraCare Beauty Club. However, you must register for this program separately. It’s free to join online at CVS.com, and new members receive a 10 percent off pass for beauty products. “As long as you stick to beauty items that are on sale and use coupons for these beauty items, it’s a great way to save and get something back for your purchases,” Woroch said about the program. Moreover, if you’re unhappy with a beauty product, you can return it for a full refund, thanks to CVS’s money-back guarantee — even after you opened and used it. You should always make your first stop in CVS the ExtraCare Coupon Center, said Mary Hoover, creator of the money-saving blog MissiontoSave.com. Scan your CVS ExtraCare card at this red kiosk to receive store coupons, which can often be stacked with store promotions and manufacturer coupons for even more savings. The kiosk will also provide you with a summary of any CVS coupons you received by email and had sent to your ExtraCare card. For added convenience, you can redeem your quarterly ExtraBucks at the ExtraCare Coupon Center. “The way to save the most at CVS is by stacking coupons and current store promotions,” Hoover said. Customers should start by checking the weekly ads for ExtraBucks offers that provide additional rewards on certain items. Next, look for manufacturer coupons for those items on sites such as Savings.com and Coupons.com. Be sure to check CVS.com for store coupons and CVS ads that can be combined with the manufacturer coupons for even more savings, Hoover said. From household essentials and food items to beauty products and office supplies, CVS offers an extensive line of affordable generic-brand goods that are comparable to popular brand-name items and available at lower prices, Woroch said. She went on to reveal that customers could often save 20 percent to 30 percent on purchases, simply by purchasing the CVS brand. It’s not enough to have a CVS rewards card. If you download the free CVS app, you can also get exclusive mobile offers, Woroch said. You can link your ExtraCare card to the app simply by scanning it. According to Woroch, consumers can then send deals to their cards for instant redemption at checkout. You can get up to 20 percent off plus free shipping if you use the CVS.com Ship & Save program to schedule regular, automatic deliveries of certain items. Although you can’t combine the discount with sales offers, you will get the sale price — if it’s greater — on your first order. Items that are eligible for Ship & Save will include an option to schedule a recurring delivery online. If CVS marks down an item but it’s already sold out by the time you get to the store, you can secure a raincheck, according to SimplyCVSShopping.com — a site about saving money at the pharmacy chain. Simply let a sales clerk know that the item you desire isn’t available, and you’ll receive a slip of paper showing the sale price and the number of products you want. Rainchecks never expire, according to CVS.com. So, you can bring your raincheck back when you want to get the sale price you missed out on the first time. 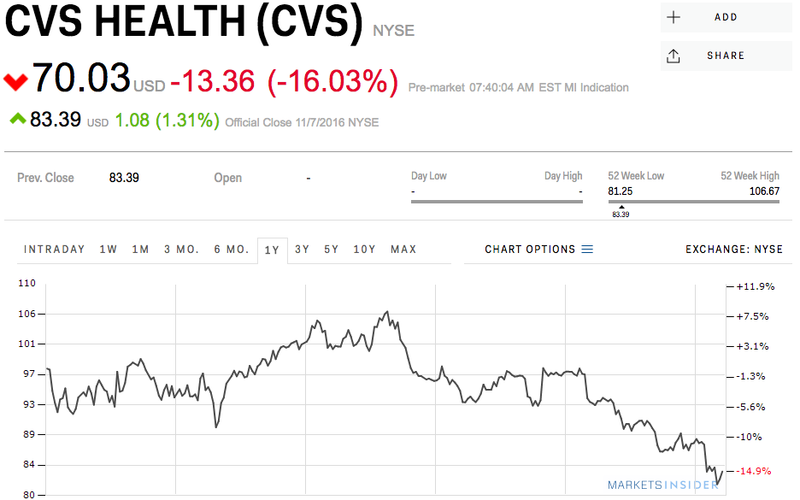 For the third quarter, CVS reported net revenue of $44.6 billion, below the forecast for $45.3 billion according to Bloomberg.